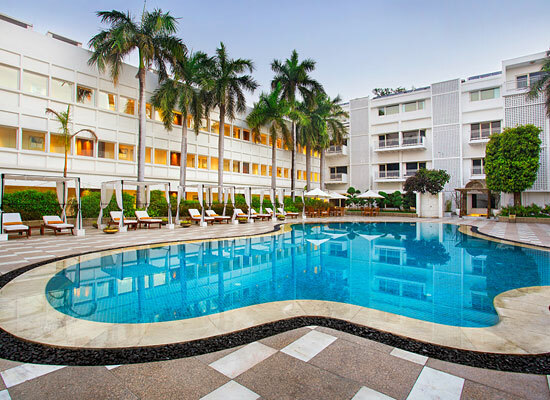 "The heritage hotel in New Delhi, The Claridges provides a luxury accommodation facility to the guests where they could witness the magic of old Delhi along with the modern luxury of New Delhi. The hotel is one of the best options of accommodation for corporate and leisure tourists because of its close proximity to the business and entertainment districts in the city. The Claridges, New Delhi became independent India’s first 5-star hotel in 1952. The hotel exemplifies the glorious heritage of hospitality. Set in an eminent address in Lutyen’s Delhi, the hotel is an important relic in the history of India’s first days as an independent country. A historical landmark, The Claridges New Delhi is an ideal destination for a traveler to enjoy India’s magnificent past, with modern luxuries for guests enjoying a comfortable stay. 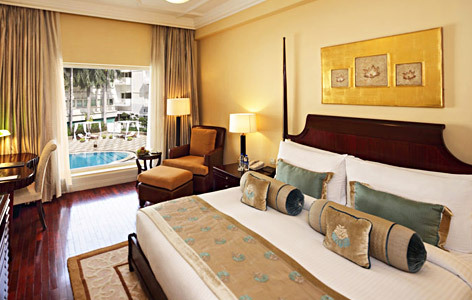 140 luxurious rooms with state-of-the-art amenities are a part of The Claridges, New Delhi. Aesthetically designed Superior rooms provide an ideal environment for rejuvenation or work. The spacious rooms have large windows overlooking the swimming pool, landscaped garden and surroundings. The Claridges rooms are artistically decorated to create a space that is peaceful and pleasant. Big windows providing ample natural light and facilities provide other comforts. The rooms have an attached private balcony that overlooks either the pool or the lush Claridges Garden. The Claridges’ Club room has the decor and style of British colonial days. Guests are treated to a beautiful city and landscape views. The world- class facilities offers guests a comfortable stay. Deluxe rooms brings the word splendid to mind. It is equipped to provide a comfortable stay. The huge windows in the rooms bring in ample amount of sunshine and views of the lush greenery. The Claridges’ Luxury Suite presents a pleasant view of the Claridges Garden with fountains amid lush greens. The suite features a living, sitting, study area, bedroom and bathrooms. Lavish facilities add to the comfortable stay for guests in the room. 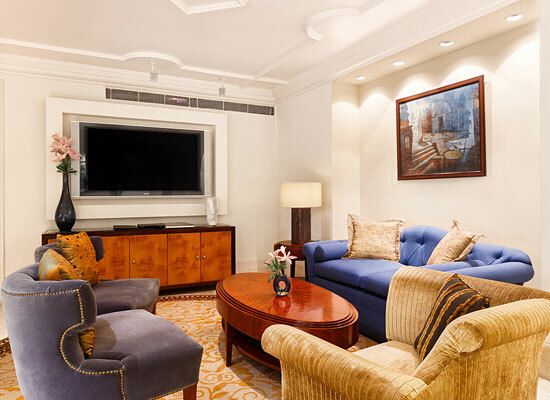 Designed to fascinate, the Claridges Suite is the best accommodation for guests in the hotel. The suite has an attached private balcony overlooking the manicured expanse of the Claridges Garden. 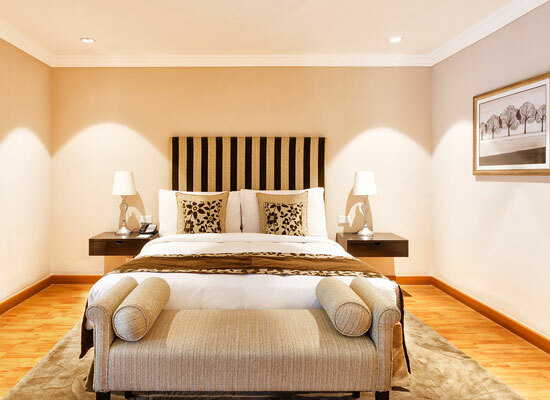 The luxurious colonial setting and the range of facilities creates a comfortable stay. Dining in The Claridges is a connoisseur’s delight. From an eclectic mix of Indian and International cuisines, the specialty restaurants treat guests with quite an unforgettable experience. The specialty restaurant serves authentic Punjabi cuisine in a truly rustic style. The typical highway eatery, Dhaba takes you to the by-lanes of Punjab with its favors, aromas and the produce of the land. The experience is of the real India, the rural India. For the globetrotter, this all day-dining restaurant is a delight. On offers are international fares whether you seek a breakfast, lunch or dinner. The best place for a Chinese cuisine lovers, the restaurant offers sumptuous platters inspired from the secret recipes of China. Jade artefacts adorn the décor and the dishes taking you on journey to the land. This lounge and bar is a paradise for vodka lovers. Over 55 brands of vodka, divine cocktails, scrumptious appetizers and groovy music are on offer. It is one of the city’s hottest party destination. Treat yourself to a Mediterranean experience at Sevilla. The mystical ambiance is perfect for a quite dinner. The restaurant is the best spot to savor authentic Mediterranean delicacies. Set in an expansive lush green garden lined with a row of palm trees, The Claridges Garden is the perfect haven to escape from a busy day in the city. The beautiful outdoor seating has made it a favorite for hi-tea sessions, scrumptious Champagne brunches or a round of beer with friends. A special place for all dessert lovers, Ye Old Bakery is one of Delhi’s oldest patisseries. From bitter chocolate cake and corn pudding to spread of freshly baked breads, cookies, cakes and pastries, wish of it and they have it all. New Delhi is perhaps the most visited city in the country of India. The fact that it is the capital city of the country might be the prime reason for this, but it is definitely not the only one. The city is replete with old world charms and modern style of living. It is precisely the seamless blending of these two contradictory attributes that provide such enigmatic and enchanting aura to the city. The city has been divided into two sections; the unplanned, overcrowded Old Delhi and the well-planned, modernized New Delhi. Both the sections have their unique attraction and glory.